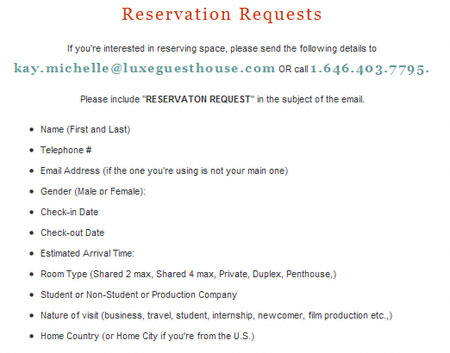 or would that be the Luxe Guesthouse? Greetings… I noticed that you covered the “shadiness” that is the development at 184 Eagle St. 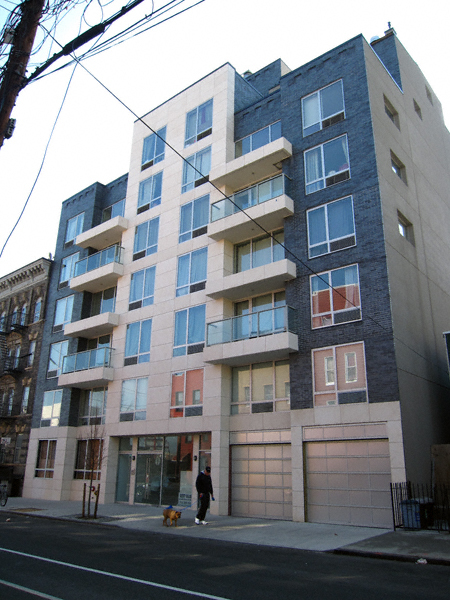 I am sad to say, I am a resident at 184 Eagle St, and unbelievably I am under a lease. I can tell you first hand that this place is basically a Hostel, and while most original tenants have found a way out of here, I am still trying (with my security/last month intact). Nevertheless, shady things keep happening at the building (the other day a group of girls at the door asked me if the “club” was open today, whatever that means). Perhaps that D.O.B. complaint I found so amusing is true? In closing here are some screencaps of Luxe Guesthouse’s and Department of Buildings respective web sites for your amusement. Since when in the course of requesting a reservation is one’s gender, nature of visit and nationality been relevant to secure a place to hang one’s hat. Oh wait, I forgot, this place is totally illegal! 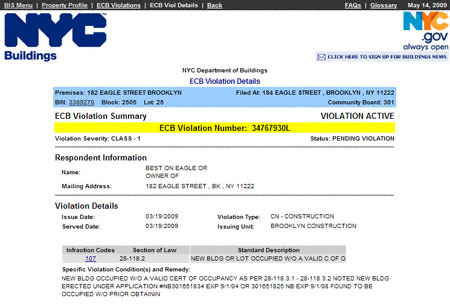 1/30/09: the Department of Buildings takes note that 184 Eagle Street is a new building without a valid Certificate of Occupancy. 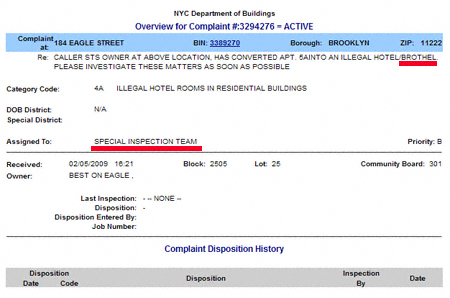 2/27/09: I am tipped off to an illegal hotel/hostel being operated at 184 Eagle Street. 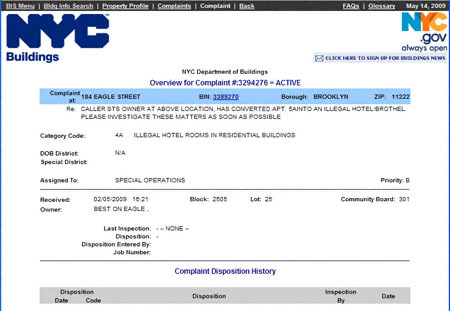 2/28/09: I am tipped off that the powers behind Luxe Guesthouse have been canvassing Greenpoint businesses. 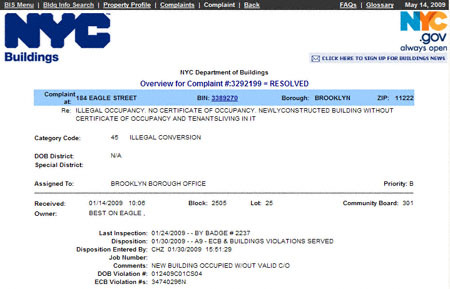 3/19/09: the Department of Buildings takes note, once again, that 184 Eagle Street has no valid Certificate of Occupancy. 3/30/09: I beat my head against the wall once again. 394 McGuiness Blvd. LIC, NY 11222. We have a building with no certificate of occupancy whatsoever. and patrons of an illegal hotel/hostel. The Department of Buildings is clearly aware of C of O issue. They have cited the owners of this building twice for this offence. 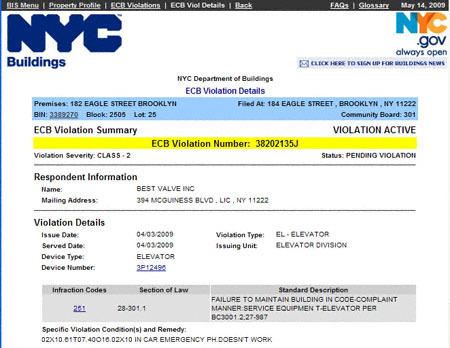 They have cited the owners of this building for an inoperative elevator. Yet the Department of Buildings has yet to figure out what many of us know already: 184 Eagle Street is being run as an illegal hostel/hotel. to establish how a property is to be used, e.g. ; residential, commercial, manufacturing, etc. it also establishes occupancy, e.g. ; how many people can be in said space. it is used to determine taxes on landlords. 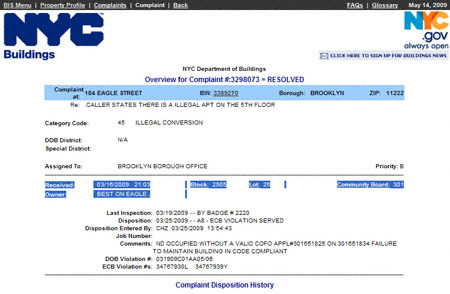 This building has no Certificate of Occupancy. 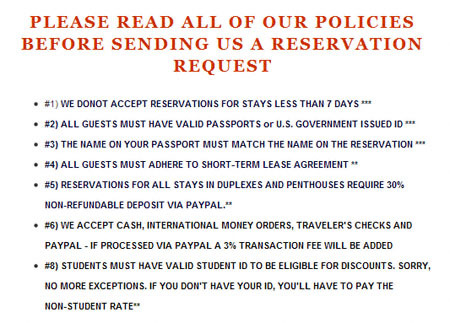 Luxe Guesthouse, AKA: 184 Eagle Street, will only take cash, money orders, travelers checks and paypal. Can you say tax evasion?